Barely a day goes by without another report on the impact of cuts on local services, as councils start the difficult process of managing yet another round of cuts. Today, I was speaking at Scottish Labour's Highland conference in Inverness. The Highland Council's plans to cut services were all over the media this morning, a timely reminder of the problems that face councils across the country. As with most of these stories, they end with a Scottish Government spokesperson claiming that councils are getting a 'fair deal'. Even allowing for the exigencies of government spin, this is simply not true. Councils have had an 8% cut in real terms since 2010/11. This isn't just down to Tory austerity, wicked though that is. Since 2013-14 council budget allocations have been cut by 6.9%, while the Scottish Government's Revenue Budget fell by 1.6%. Yes, there has been extra money for the government's priorities, but there has been a £590m cut in core funding. The money that pays for the basic local services that mark a civilised society. Council's have plugged the gap with a 13% increase in charges, a regressive tax that hits the poorest in society. They have also used up an unsustainable £79m of reserves along with £500m of cuts. The biggest impact has been in local employment, with 30,000 jobs gone since the crash. If councils have had such a 'fair deal', then why are 9 out of 10 austerity job cuts in local government? The last minute budget deal last year helped, but it still left a £225m revenue cut, in a year when the when the Scottish Government budget went up. It was mitigated by £100m from the change in council tax bands and lifting the council tax freeze. However, that still left a revenue shortfall of at least £55m. And that was just the consequences of central budget allocations. Councils faced additional unavoidable commitments like the apprenticeships levy and the cost of an ageing population. 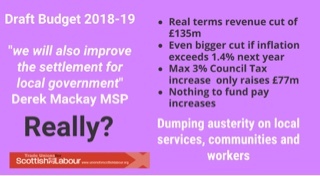 In the current budget debate,the Scottish Government is receiving a £188m cash increase in its budget from Westminster, yet local government gets nothing. In real terms it is a £135m to £153m cut. Even if every council increased the council tax by the maximum 3% allowed, it would only generate £77m. In practice, the cuts will be much worse because ‘real terms’ inflation will be much higher than the 1.4% assumed in the budget. The OBR forecasts are for RPI to rise 3.3% and CPI by 2.4%. There is no funding to meet the Scottish Government's new pay policy, which itself is less than the cost of living. These are the numbers, but what about impact on services? UNISON has outlined the views of staff in eighteen ‘Damage’ reports. The common theme is that jobs are cut while demand increases, leaving staff stressed and demoralised while they attempt to keep basic services going. Even statutory services have been cut and preventative work dropped almost entirely. An example of this is building control. Even after the Grenfell Tower tragedy, building control staff spend little time inspecting properties, while they cope with vacancies and government bureaucracy. These cuts have a disproportionate impact on low income families who have a greater reliance on local services. Less obvious is the impact on the economy. On Monday, the Jimmy Reid Foundation will publish a report commissioned by UNISON Scotland on this issue. It shows how local authority funding is crucial to sustain and grow economic and social benefits to local communities and society in Scotland as a whole. We simply cannot go on like this. We need a proper reform local finance, including the use of discretionary taxation. An end to ring fencing budgets and for central government to properly fund its own initiatives that are delivered locally. Of course we should also look at reform and the Local Governance Review announced by COSLA and the Scottish Government before Christmas is an important initiative. But that won't plug the gaping financial gap anytime soon. Tory Austerity isn't ending short of a general election and the U.K. Government keeps digging itself a bigger hole rather than changing course. But that austerity has largely been dumped on councils in Scotland, and more. The suspicion is that's because it is far removed from ministers in Edinburgh. Everyone who cares about democratically accountable local services should be making the case for fair funding in the current budget debate. That then provides the basis for a serious debate about strengthening local democracy. Pensions are meant to safeguard our future, but that future is threatened by the burning of carbon in fossil fuels like coal, oil and gas. It's also a poor investment, which is why there is a growing movement to divest our pensions from fossil fuel investments. I was in London yesterday for our UK annual pensions conference, which included the launch of UNISON’s new guide on this issue. It is designed to help members of local government pension schemes push for changes in the investment of their funds. The aim is to explore alternative investment opportunities, allowing funds to sell their shares and bonds in fossil fuels and to go carbon-free. This is an issue that UNISON Scotland has championed for several years with our ReIvest campaign partners, FoE and Common Weal. 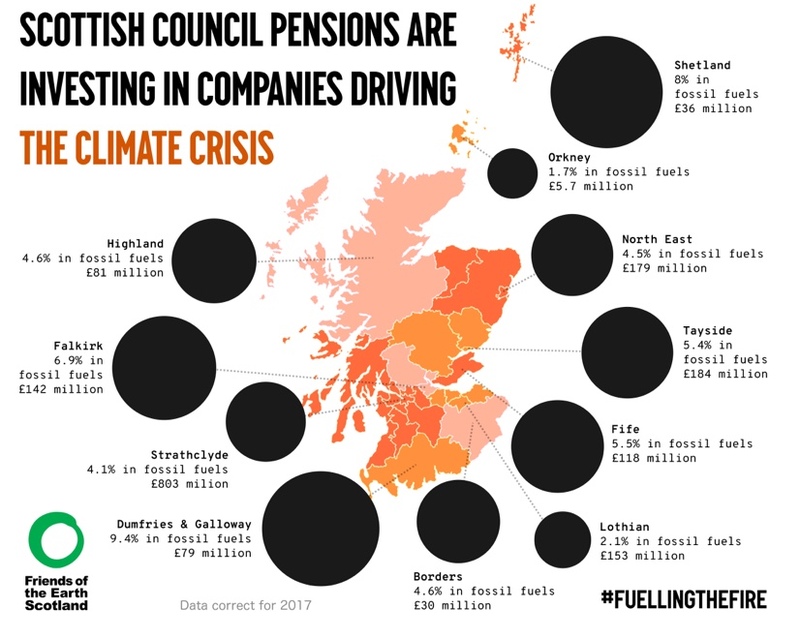 Scottish Local Government Pension Scheme funds have some £1.8bn invested in fossil fuel companies - that figure grows to £16bn across the UK. New government regulations for fossil fuels have raised the costs of high-polluting industries and reduced their investment appeal. Equally, emerging clean and green technology has created new and lucrative business opportunities for funds. The UK government is also consulting on allowing pension schemes to dump fossil fuel investments by dropping ‘best returns’ legal rules. In Scotland, all local authorities, including those who administer the local SLGPS funds, have a statutory duty to reduce emissions in accordance with the Climate Change (Scotland) Act. That is an additional reason for challenging investment proposals to invest in fossil fuels. One of the strengths of this new guide is to challenge the conventional wisdom that fiduciary duty is a barrier to divestment. The law is actually quite clear, pension funds should consider any factors that have a financial impact on the performance of their investments, including social, environmental and corporate governance factors. Trustees can take account of non- financial factors where they have good reason to think that scheme members share their view, and there is no risk of major financial harm to the fund. The guide also sets out a range of actions anyone who is concerned about this issue can take - not just our union branches and members. By investing in fossil fuel extraction, our local councils are attempting to take a short term profit from climate change. As public bodies, councils have a responsibility to work for the public good, they shouldn’t be financially and politically supporting the most destructive industry on the planet. 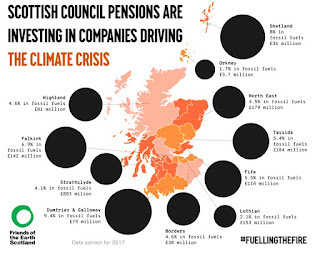 Fossil fuel investments undermine existing Scottish and local authority climate change mitigation and adaptation strategies. Let's protect our hard earned pensions and leave a planet fit for future generations. A brisk walk along the beach to clear my head from the excesses of last night, leads to reflections on 2017 and thoughts for the year ahead. The UK general election was obviously one of two dominant issues last year. Jeremy Corbyn led a recovery in Labour's position that few predicted, based on radical policies that tuned into the concerns of the many, not the few. The other was Brexit, which continues to polarise opinion and distract from the huge challenges we face as a society. I would add the Scottish Labour leadership election which, through the election of Richard Leonard, sets a new direction for the party in Scotland. Looking back on my blog statistics for last year, posts on local government finance topped the number of reads. While the reason and content varied, the substance was the same - Tory austerity has largely been dumped on local government in Scotland. Partly because it is one step removed from ministers, but also because we haven't done enough to make the case for local democracy and services. It is something we need to focus more effort on in 2018. The next most popular batch of posts was, perhaps surprisingly, on health and safety themes. In particular, research I did on shift working and before that the ageing workforce, clearly tapped into a wider audience. The impact of technology, automation and life expectancy are workplace issues we should give more consideration to. The basic income pilots in Scotland are one response and I suspect I will be spending considerable time on our pension schemes in 2018. Election posts and the Scottish Labour leadership election came a close third. We must always be prepared for another UK general election in 2018. The Scottish Labour leadership contest means we are a bit behind organisationally, and we will need to catch up early in the new year. However, being a truly mass membership party is a good starting point and the party needs to change to reflect that new reality. The review led by Katy Clark should help to focus minds on the key issues, although it is a matter for the Scottish Labour Party to take forward change here. The potential of a break in the annual cycle of elections in Scotland is an opportunity to be more creative in policy development. Public service reform is likely to be high on the agenda this year and I hope to find time to develop the ideas I outlined in my Reid Foundation paper on this issue. I will also be doing some work on the local governance review, which is an opportunity to breathe some new life into local democracy. 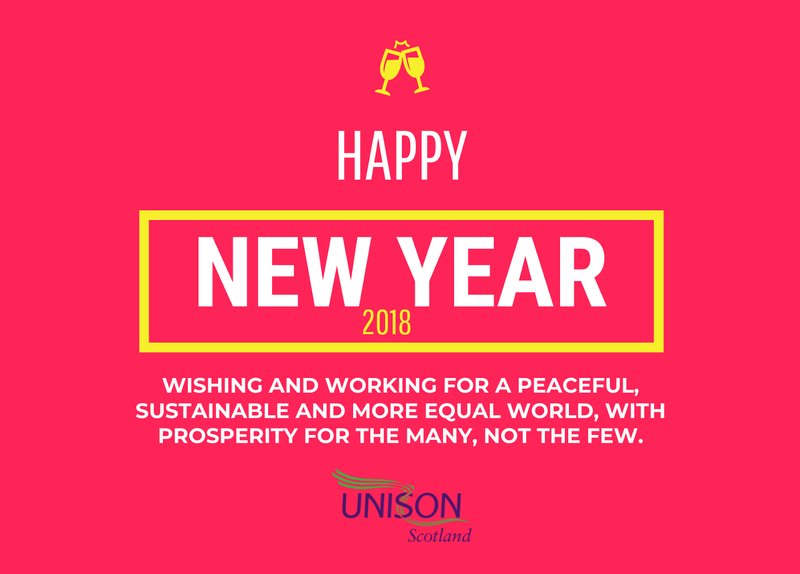 The Scottish Parliament was created 20 years ago and while I am not going to join those who denigrate its achievements, I agree that it is time for our parliament to be bolder, particularly over tackling inequality. The early part of the year will be dominated by the budget and austerity will continue to blight our economy and public services. Local government and pay will be our focus. On pay, the new government pay policy, while progress in the right direction, still falls short of what we were looking for. Equally important, a paper policy is of little use if it is not fully funded. I fear the rest of the year will be dominated by Brexit as the UK government attempts to balance their internal conflicts and the hugely difficult negotiations, without any sense of direction. Something that even the newest shop steward understands is a vital element of any negotiation. I have no time for those who want to dance on a pin in defining Labour's position, or use it as a proxy for attacking the leadership. However, the consequences for Scotland of Brexit are potentially severe and probably not yet fully understood. We should also not forget the opportunities for Scotland, both in terms of devolved powers and in those areas were EU regulation has been a barrier. All this requires some very tricky balancing acts. Some of my personal goals for 2017 were not achieved - not least I am no lighter and Fulham's performances on the football pitch mirror inconsistency in other areas of public life. However, I am if nothing an optimist, in my view the essential quality every socialist needs. 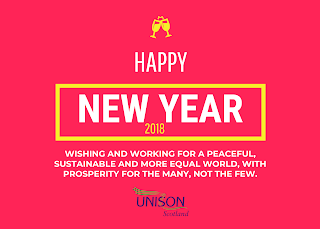 So here's wishing everyone a prosperous 2018 - I hope a year in which we make further strides in creating a society that works for the many not the few.